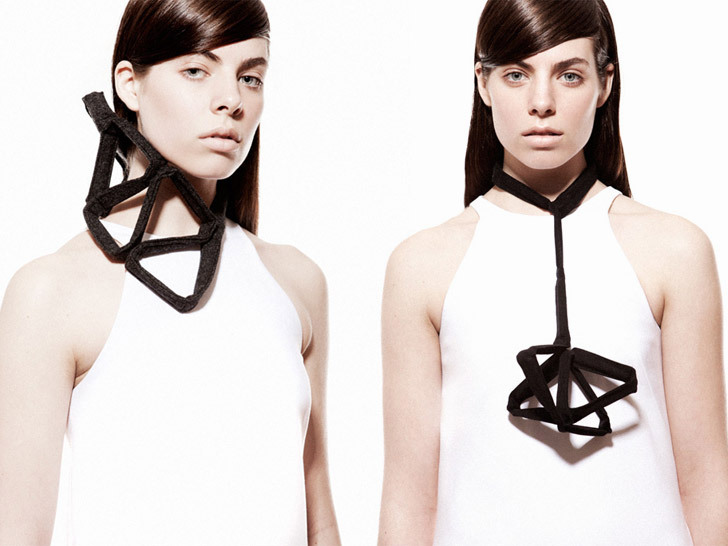 If you've often berated your scarf for just lying there being all limp and "scarf-y," get a load of Noah Waxman's line of "Fe Wearables." The NYC-made accessories, composed of organic-cotton canvas, wool felt, and super-powerful magnets, can be configured and reconfigured into nearly any shape you dream up. 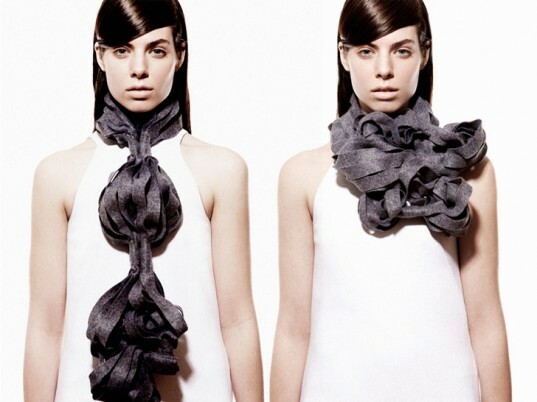 Wear the "Trestle" or "Billow" as a scarf, cowl, necklace, or a headband, if you so fancy, bust mostly wear it as a testament to your creativity. Available in your choice of canvas or felt, each Fe Wearable can be finessed into hundreds of different looks. His original concept—a garment that transformed into different shapes as a mode of creative expression—survived in spirit, even if the electrical components didn’t. “I scrapped what I was doing and sewed a whole bunch of magnets into all sorts of cloth,” he says. By the end of the week, his friends were wearing his early prototypes all over town. After sketching several designs, Waxman honed in on two styles he wanted to take further: the Trestle, a skinny, linear neckpiece that flexes into squares and triangles, and the Billow, a fluid and bunchy stole-and-muffler combo. Available in red, white, black, and charcoal, in your choice of canvas or felt, each one can be finessed into hundreds of different looks. Waxman is currently working with local manufacturers in Manhattan to bring his line to market, but he needs funds to purchase materials and meet minimum-order requirements. If you pledge $55 or more on Kickstarter, you can score a Trestle or Billow of your own. Waxman is currently working with local manufacturers in Manhattan to bring his line to market, but he needs help. After he gets them out in stores, Waxman plans on creating a blog for people to showcase their favorite Fe Wearable configurations. Could yours be one of them? Waxman came upon the design by accident while working on an electronics project at New York University. "I was working with nitinol 'muscle wire' with the hopes of electronic morphing garment," he tells Ecouterre. "I used magnets as a prototyping tool but then loved the way the magnets and cloth behaved together." After sketching several designs, Waxman honed in on two styles he wanted to take further: the Trestle, a skinny, linear neckpiece that flexes into squares and triangles, and the Billow, a fluid and bunchy stole-and-muffler combo. Available in red, white, black, and charcoal, in your choice of canvas or felt, each one can be finessed into hundreds of different looks. Waxman is currently working with local manufacturers in Manhattan to bring his line to market, but he needs funds to purchase materials and meet minimum-order requirements. If you pledge $55 or more on Kickstarter, you can score a Trestle or Billow of your own. In addition to an initial production run, Waxman would also like the financial wherewithal to experiment. "New materials. New sizes. New shapes," he says. "Can an entire outfit be made in this way? Plastics, silicone, long narrow magnets, stone elements, wooden elements...there are a lot of ideas for the future!"